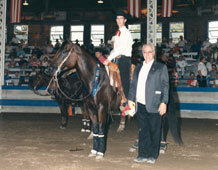 Doug Bogart's love of working with horses began in his youth where training was a family affair. His father was a trainer known for his ability to work with “problem horses” and Doug grew up competing in barrel and pleasure classes. 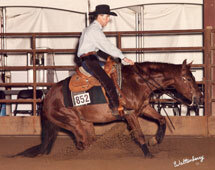 When Doug was seventeen he had his first opportunity to ride an equitation school master. It was at this point that Doug’s views on working with horses began to change. Determined to find a way to train using something other than some of the rough and rushed methods he had see in the western world, he sought to learn a better way of riding and teaching. Though he believed firmly in the solid training methods he rode with in dressage and enjoyed the intensity of the sport, Doug still felt himself being drawn to his western roots. It was not until he felt the responsiveness and high-powered maneuvers of a well trained reining horse that he saw a way to blend the two. With the help of Delmar Albrecht, Doug began his began his transition into reining in the 1980's, purchasing his first reiner from Del. Doug has now successfully transformed Kjellerup’s insightful and demanding program into a training method that works equally as well in the reining world. 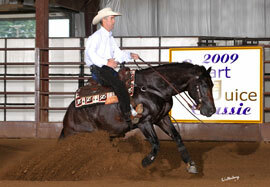 Doug has also been proud to be involved with the American Riding Instructors Association. 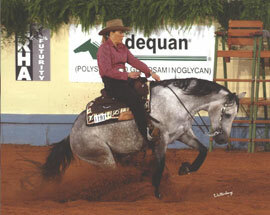 The ARIA was established in 1984 to help promote safe, knowledgeable riding instruction. The ARIA currently certifies instructors in 15 riding disciplines. 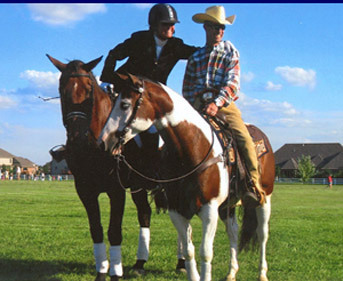 Doug is a Level III (Beginner through Advanced) Instructor in Western and Reining and was please to receive the ARIA 2009 Top 50 Instructors in America reward. Doug currently lives in Rock Island, Illinois and trains at Schmidt Farms in Milan, Illinois. When not working with horses or students Doug enjoys spending time with his wife Jill and playing drums in a country western band.